Alaska has many places with interesting geothermal features but only one has true geysers – Mount Recheshnoi Geyser field on Umnak Island. Hot springs in this location were first mentioned in written sources by Baltic geologist of Dutch descent Constantin von Grewingk in 1850. Local Aleuts for sure knew about these geysers much longer. More thorough research took place in 1947, 1980 and 1988. All geysers are located in wide valley at the foot of Mount Recheshnoi volcano. This valley has been formed by glacier and now here flows a stream – Geyser Creek. 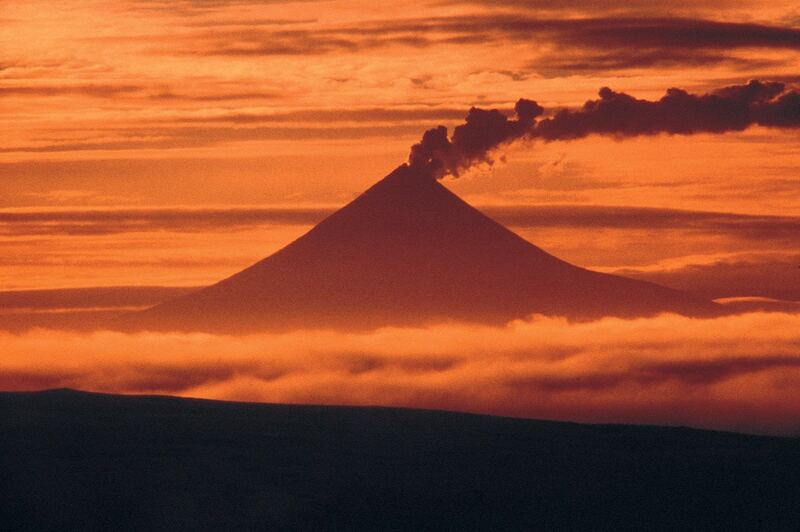 Geothermal energy is provided by the plume of magma under Mount Recheshnoi. Water below the ground level is superheated – it is considered that the temperature of steam deep under the ground exceeds 265 °C. Hydrothermal features are spread along the Geyser Creek and its tributaries over an area of 4 km². 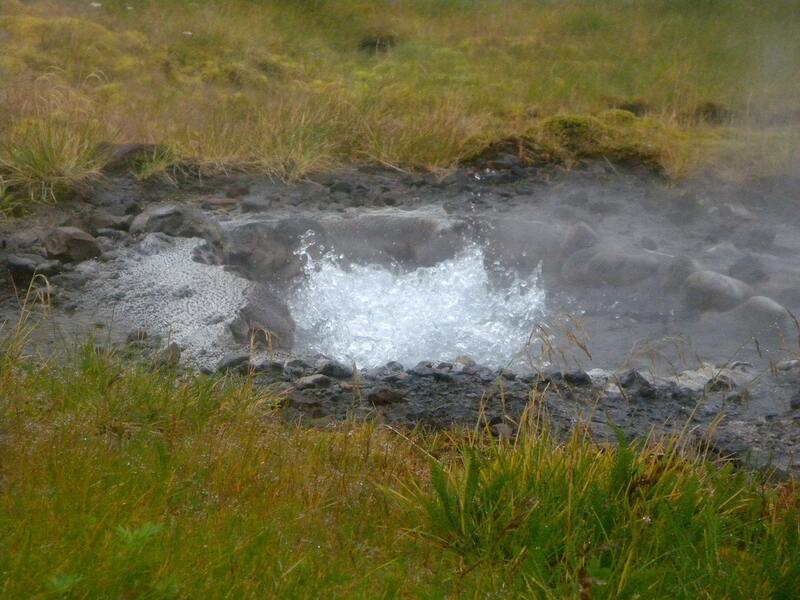 Here are found not just geysers but also natural fountains, boiling (effervescent) springs and mud pools. As it is usual in most geyser fields in the world, as the time goes, the number of active geysers is changing. One characteristic though makes the geysers of Umnak unique – the water of these hot springs contains much boron and arsenic. In this site in 1947 were reported 1 geyser and 1 fountain. In 1980 here were 4 geysers. In 1988 here was 1 geyser and 6 fountains, which were up to 30 cm high. The geyser in 1988 represented a water filled bowl of sinter. Every 12 minutes it erupted 0.2 m high. Back in 1870 it was 0.6 m tall. Here in 1947 were 3 geysers, in 1980 – 3 geysers and 1 fountain, in 1988 – 3 geysers and 3 fountains. One of fountains in 1988 was up to 0.7 m tall – this same fountain in 1947 was a geyser, which erupted every 2.5 – 3.5 minutes. 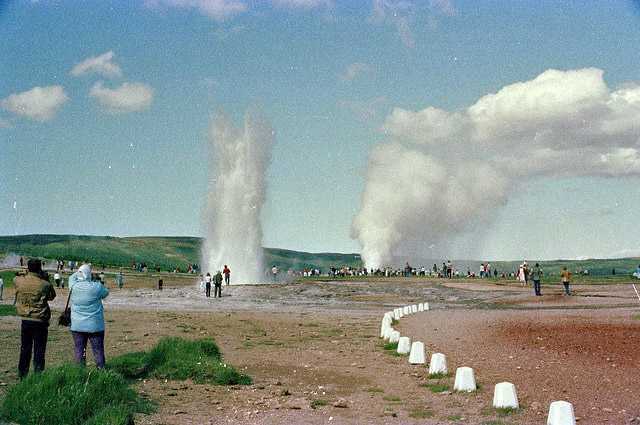 One geyser in 1988 was up to 2 m high, another one – 0.5 m high. Here at a smaller creek have formed serveral geothermal features. In 1947 this location has not been mentioned, in 1980 here was 1 geyser. In 1988 here was found 1 geyser – a small pool, where approximately once per hour were emitted gases and increased water flow. Christopher J.Nye, Roman J. Motyka, Donald L. Turner, Shirley A.Liss. Geology and Geochemistry of the Geyser Bight Geothermal Area, Umnak Island, Aleutian Islands, Alaska. 1990. F.M. & Brannock, W.W. Byers, Volcanic Activity on Umnak and Great Sitkin Islands, 1946 – 1948. Rachel Imrie’s Blog, accessed on May 4, 2012. This far northern land is very diverse and its landscape is spectacular. Alaska though is not very rich with separate, specific landmarks – this is a land which brings a very special emotional experience as a whole. Singling out some specific landmarks here feels somehow out of place – Alaska is magnificent with its wast glaciers, supertall mountains, numerous active volcanoes, endless forests, deep canyons. An Aleutian history compiled by Tyler M. Schlung and students of the Nikolski School, Umnak Island, Alaska.